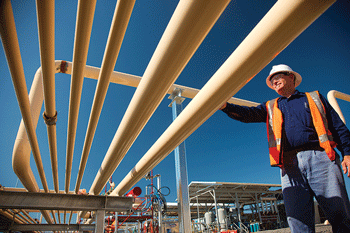 Toowoomba specialist gas industry supplier Easternwell, a Broadspectrum subsidiary, has snared a multi-million dollar contract that will sustain more than 300 jobs and flow-on for other local businesses. Visiting Easternwell’s workshop in Toowoomba today, Natural Resources, Mines and Energy Minister Dr Anthony Lynham said the five-year contract would deliver a major injection into the city’s economy. “The south-west Queensland gas industry continues to fuel Toowoomba and the Downs’s economy when it comes to jobs and business opportunities,” he said. “It’s great to see this contract with Shell’s QGC business generating local employment, including more contracts for local Indigenous businesses. “Statewide the oil and gas industry continues to directly employ some 8000 people and contribute to the state with an expected $447 million in royalties in 2018‑19. Mr Tony Nunan, Shell’s VP QGC said: “Our natural gas business is a multi-decade investment across the region, helping create jobs, boost income for communities and increase domestic energy supply. Dr Lynham said Queensland continued to be the nation’s energy powerhouse. “We have the lowest wholesale electricity prices, are a net exporter of gas to the eastern states and a leader in policy initiatives to tackle domestic gas supply issues,” he said. “We have three companies with licences in the Surat to seek out or produce gas for the domestic market only, and a structured plan to deliver effective incentives for explorers. “The Palaszczuk Government’s wants to keep growing Queensland as a reliable and affordable gas producer to drive regional economic growth, to provide gas to our industry and manufacturers, and for electricity generation.